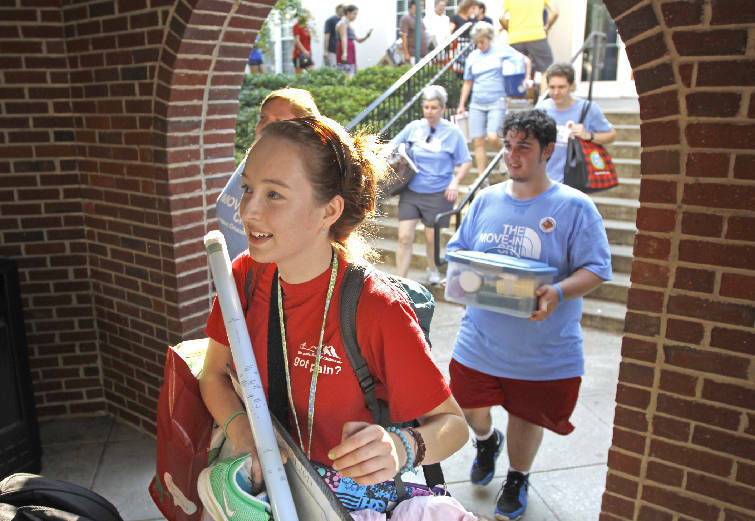 Steffi Sellge, a new UTC freshman from Nashville and a host of volunteers help her move into the on-campus Decosimo dorms Thursday morning. For the first time, local higher education institutions are offering more than two dozen majors that can be transferred easily from one college to another. The University of Tennessee system and the Tennessee Board of Regents announced last week the creation of "Tennessee Transfer Pathways" to help students transition from a two- to four-year college. Of 34 majors offered statewide, the University of Tennessee at Chattanooga and Chattanooga State and Cleveland State community colleges offer 23 to 24 majors, ranging from business administration and psychology -- two of the most popular ones -- to chemistry and electrical engineering. "The pathways selected to be completed this year represent about 90 percent of transfers that occur," said Jerry Faulkner, vice president for academic affairs at Cleveland State. The school will evaluate this year whether there are any other majors that need to be included in the program and decide what resources are needed to add them, he said. The pathways have the potential to affect more than 4,500 students transferring from public community colleges to universities each year, said Katie High, interim vice president for academic affairs and student success for the UT system. Fannie Hew-lett, provost and vice president for academic affairs at Chattanooga State, called the new system "one of the most positive things" the state has done to make it easier for students in community college who want to transfer to a four-year institution without losing credits. Before, community college students transferring to another college or university ran the risk of having class credits that weren't valid in their new school. Under the new system, a student who chooses one of 50 available pathways -- and follows it exactly as it's written -- is guaranteed that all earned credit hours will apply toward a bachelor's degree in the same discipline. One of the main goals of the state is to increase the number of students with a bachelor's degree, said High, but having different curriculums and requirements can frustrate students and reduce their chances of getting a four-year degree. The biggest challenge with transfer students is the lack of effective communication, said Phil Oldham, provost at UTC. "This gives options that will hopefully be best for the students," he said. About half of UTC's transfer students were from community colleges last fall, he said. Officials at Chattanooga State and Cleveland State said 30 percent to 50 percent of their students say they intend to transfer to a four-year institution. And even though classes have started at some colleges, school officials said it's not too late to get on a pathway. "It is probably going to mean we will have to skate backward for a little while and identify students and make sure they understand what the pathways has to offer," Hewlett said.